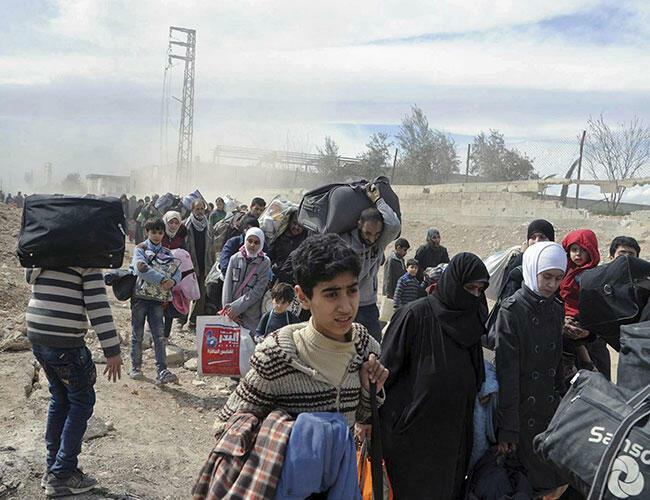 Via Hürriyet Daily News – Opposition authorities are issuing new ID cards in northern Syria with help from neighboring Turkey, expanding their administration over territory that remains outside President Bashar al-Assad’s expanding area of control. For the many Syrians who lost all forms of identification during the seven-year-long war, the cards stamped with the flag of the anti-Assad opposition represent a step towards leading a normal life again. Translated into Turkish, they also underline the extent of Turkish influence that will complicate Assad’s efforts to win back the area as he crushes the last remaining pockets of insurgent territory elsewhere, helped by Russia and Iran. “The materials that are used in producing the identities are all from Turkey,” said Abdulrazzaq Abdulrazzaq, an official in the al-Bab city council. Personal data inputted during the process is also “shared with the Turkish side”, he added. Al-Bab is part of a 100 km (60 mile) wide piece of territory near Syria’s northern border where Turkey carved out a de facto buffer zone in its 2016 “Euphrates Shield” offensive into Syrian territory. The operation forced Islamic State of Iraq and Levant (ISIL) away from the border but also drove a wedge between two predominantly Kurdish regions of northern Syria, where Ankara has been deeply alarmed by the growth of Kurdish power –specifically the growth of the People’s Protection Units (YPG), considered a terror network due to its links to the Kurdistan Workers’ Party (PKK), which has waged a three-decade insurgency in Turkey. Syrian rebel authorities have sought to develop their own administration in the region. They are being aided by Turkey which is helping with reconstruction and training a new police force. The Syrian government has accused Turkey of pursuing imperial ambitions in northern Syria. Assad has vowed to recover control of the entire country. A Turkish security official said that in addition to ID cards, the process for issuing car license plates had also begun in the Euphrates Shield area. “The aim in this is to secure the area completely. An organized social life is being built there. One of the first necessities is an ID card,” the official said. “Turkey is supporting this process,” said the official. The official added that one main objective was to make sure civilians had a way to distinguish themselves from members of ISIL or the Syrian Kurdish YPG militants. Abdulrazzaq is expecting to issue the cards to 140,000 people in the city of al-Bab and nearby rural areas. Applicants’ fingerprints are scanned as part of the process. The step was important for the many Syrians who lost their identity cards during the war, he said. of identity can obtain one of the new IDs with statements from two witnesses confirming their identity. Omar Alwan, 24, was one of the first in line. “I can’t issue an ID from the regime because I am wanted,” he said. “Firstly, I am wanted for military service and secondly, I am wanted on the charge of protesting,” he said. Othman al-Othman, a pharmacist from al-Bab, said he would carry both the new ID and his old identity card. He said the card was a necessity in a region “crammed with strangers” – a reference to the many displaced Syrians living there. This article was originally published by Hürriyet Daily News.